MRB Tamilnadu Notification is out. 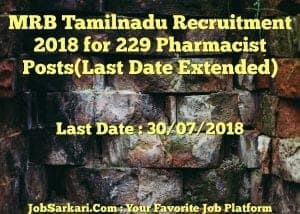 MRB Tamilnadu is recruiting for 229 Pharmacist Posts. You can check MRB Tamilnadu - Medical Services Recruitment Board Tamil Nadu last date, download MRB Tamilnadu notification, visit MRB Tamilnadu official website and check other MRB Tamilnadu Vacancy details.Complete Vacancy and recruitment Details about 229 Pharmacist vacancies in MRB Tamilnadu are provided below by JobSarkari.Com only for you. Advertisement Date – 13/02/2018. Last Date for Apply Online – 30/07/2018. Last Date for Offline Payment of Fees – 01/08/2018. General / OBC – Rs.500/-. SC / SCA / PH – Rs.250/-. Mode of Payment Application Fees Can be Paid through Online Mode Using Net Banking, Credit Card, Debit card and Mobile Wallet Payment, OR Offline Mode through E-Challan Making Payment at any of the branches of Indian Bank. Pharmacist (Siddha) Vacancy – GT – 46(13 for female) | BC – 39(12 for female) | BC(M) – 05(02 for female) | MBC/DC – 30(09 for female), SC – 22(07 for female) | SC(A) – 05(02 for female) | ST – 01. Total Posts – 148. Pharmacist (Ayurveda) Vacancy – GT – 11(03 for female) | BC – 10(03 for female) | BC(M) – 01 | MBC/DC – 08(02 for female) SC – 06(02 for female) | SC(A) – 02(01 for female). Total Posts – 38. Pharmacist (Homeopathy) Vacancy – GT – 06(02 for female) | BC – 06(02 for female) | BC(M) – 01 | MBC/DC – 05(02 for female) SC – 04(01 for female) | SC(A) – 01 for female. Total Posts – 23. Pharmacist (Unani) Vacancy – GT – 05(02 for female) | BC – 06(02 for female) | BC(M) – 01 | MBC/DC – 04(01 for female) SC – 03(01 for female) | SC(A) – 01 for female. Total Posts – 20. Total No. of Post – 229. Pharmacist (Siddha) Educational Qualifications – Candidate Must Have Diploma in Indian System of Medicine or Diploma in Pharmacy in Siddha or Diploma in Integrated Pharmacy (DIP). Pharmacist (Ayurveda) Educational Qualifications – Candidate Must Have Diploma in Indian System of Medicine or Diploma in Pharmacy in Siddha or Diploma in Integrated Pharmacy (DIP). Pharmacist (Homeopathy) Educational Qualifications – Candidate Must Have Passed SSLC Examination and Diploma in Homeopathy / Diploma in Integrated Pharmacy With Certificate of Registration „B‟ or „C‟ issued under rules 11(6) of the Tamil Nadu Homeopathy System of Medicine and Practitioners of Homeopathy Rules 1972. Pharmacist (Unani) Educational Qualifications – Candidate Must Have Diploma in Indian System of Medicine or Diploma in Pharmacy in Unani or Diploma in Integrated Pharmacy (DIP). As on 01/07/2018 Minimum – 18 Years. Maximum – 40 Years. Maximum Age for SC / ST / SCA / BC / BCM / MBC&DNC – 57 Years. Selection May be Based on. 1. Written Examination. 1.The Candidates can apply through Online mode. 2. Click Apply Online Link given on Our Website in Important link Section. 3.Candidates are required to Register before Applying for the Post and Already Register Candidate Not need to register Again. 4.After Successful Registration system will Generate a Login ID and Password on your Screen. 5.Login with the ID and Password then Start Filling Your Application form and Read all the instruction before Applying for the Post. 6.Upload the Scanned Copy of Documents in Prescribed Size and format. 7.Take Printout of your Application form for future Reference. 8. Online Application can be Submitted on or Before 30th July 2018. Download TN MRB Date Extension Notice Here. 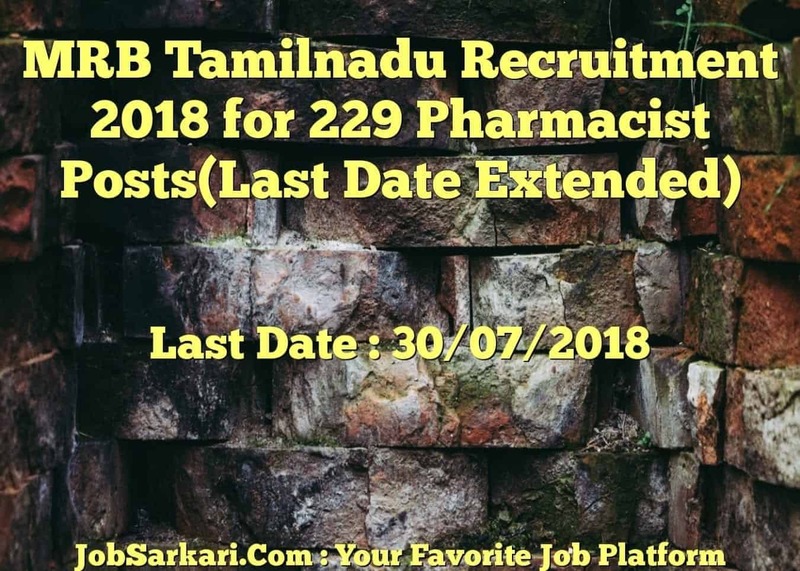 Apply Online for MRB Tamilnadu 229 Pharmacist Here. Download MRB Tamilnadu Pharmacist Siddha Notification. Download MRB Tamilnadu Pharmacist Ayurveda Notification. Download MRB Tamilnadu Pharmacist Homeopathy Notification. Download MRB Tamilnadu Pharmacist Unani Notification. MRB Tamilnadu Official Website. Q. What is the Last Date For MRB Tamilnadu Pharmacist Vacancy ? A. Last Date for MRB Tamilnadu Pharmacist Posts is 30/07/2018. Q. What is the Form Type of MRB Tamilnadu Pharmacist Recruitment ? A. The Form Type for MRB Tamilnadu Pharmacist Posts is Online. Q. How many vacancies are available in Medical Services Recruitment Board Tamil Nadu Pharmacist Posts ? A. There are about 200 Vacancies in Medical Services Recruitment Board Tamil Nadu Pharmacist Posts. Q. What is the Full Form of MRB Tamilnadu ? A. Full Form of MRB Tamilnadu is Medical Services Recruitment Board Tamil Nadu .